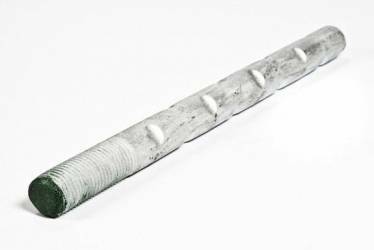 A swedged anchor bolt, sometimes referred to as a swedged anchor rod, is an alternative design to an epoxy anchor, headed anchor bolt, threaded anchor rod, or bent anchor bolt. They are often used in highway work, specifically in conjunction with bridge bearings. The threaded end projects from the concrete, while the embedded end possesses indentations that have been pressed into the round bar to provide pull-out resistance. AASHTO and the National Steel Bridge Alliance refer to these anchors as swaged anchor rods, discouraging the use of the term “anchor bolt” since it implies a forged hex head on one end of the rod. Indentations on swedged rods are typically formed by pressing deformations into the rod and displacing the steel rather than machining steel away to form the dimples. Most engineers and many departments of transportation do not specify dimensions or patterns for swedged anchor bolts. When not specified, Portland Bolt will supply what we refer to as a “standard swedge pattern” as detailed on the drawings above. These alternating indentations and will be manufactured with the size and depth of indentations indicated in the table below. However, some agencies such as the Kansas Department of Transportation utilize a “spiral swedge pattern” shown in the drawing above. Size and depth of indentations would be the same for either pattern. 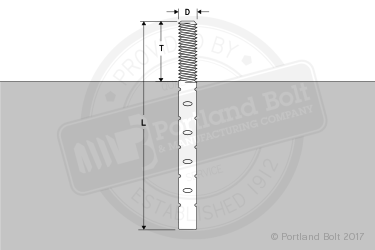 Portland Bolt has the ability to swedge anchor rods through 3″ diameter. Some engineers and other agencies may require a different swedging pattern than shown above. Simply provide us with a drawing of the pattern and indentation sizes and we will accommodate your needs. Space between dimples for standard pattern: 3″ Typ. Space between dimples for spiral pattern: 1-1/2″ Typ.